Solvent is a chemical, which dissolves in a chemically different solute to form a solution. In the solution, solute and solvent are mixed and the molecules are uniformly distributed. Organic solvents find wide use in manufacturing industries and all traditional solvent applications. Conventional solvents can be further classified into alcohols, glycol ethers, hydrocarbons, ketones, acetate esters and chlorinated solvents based on their chemical composition. Paints and coatings are required in abundance by the manufacturing and construction industries, which have witnessed exemplary growth. The high growth in the construction sector of the BRIC nations has been influential in the rising demand for solvents. In addition, solvents are extensively used in applications such as printing-inks, pharmaceuticals, sealant and adhesives, and the demand generated from these applications for organic solvents have been driving the market. However, the volatile pricing of crude oil in the international market coupled with environmental issues are a serious restraint to this market. On the other hand, mounting regulatory pressures regarding the use of organic solvents have opened up avenues for alternate “green solvents”, which are atmosphere friendly and pose little or no health hazards to the people exposed to it. Alcohol-based solvents emerged as the leading product segment with the largest market share of 29.7% terms of volume, in 2011. Hydrocarbon solvents followed alcohol in terms of market volume share and are projected to lose market share in the coming years to other types of solvents. Other solvents including bio-based solvents are expected to witness fastest growth over the forecast period, due to their eco friendly properties. Chlorinated solvents have the smallest market share mainly due to the toxic effects of the solvents. The applications of solvents include paints and coatings market, printing ink market, pharmaceutical market, cosmetics & adhesives market and others including cleaning and de-icing. Paints and coatings market emerged as the largest consumer of solvents with a market share of 60.6% in 2011. Organic solvents are used in paints to dissolve colors and binders, to provide consistency in application of the paint. Along with being the market leading application of solvents, it is also expected to be the fastest growing application over the forecast period. Solvents also find huge application in pharmaceutical drug manufacturing process. However, due to industry efforts to minimize solvents use, in order to reduce toxicity levels in the medicines, its consumption is expected to decline in the pharmaceutical industry. As of 2011, Asia-Pacific alone accounted for 40.1% of the global solvents market. Demand in Asia Pacific is expected to surge owing to heavy industrialization and rising population, driving demand for pharmaceuticals, paints, and cosmetics that are the biggest end-user of solvents. Europe followed Asia Pacific and accounted for the second largest share in the global solvents demand. Germany, France, and UK are the highest consumer of solvents in Europe. The North American solvents market, primarily US and Canada, is one of the bigger markets. The market is expected to grow at a CAGR of 3.0% over the forecast period from 2012 to 2018. Some of the key companies in the solvents market are, BASF SE, Celanese Corporation, Dow Chemical Company, Exxon Mobil Corporation, Maruzen Petrochemical, Shell Chemical, Sasol Solvents, and Solvay Chemicals among others. To present an analytical overview, the report segments the global solvents market into ester solvents, alcohol-based solvents, hydrocarbon solvents, chlorinated solvents, ketone solvents, and others in terms of product types. Alcohol-based solvents led the market in 2011, with a 29.7% share in terms of volume. Hydrocarbon-based solvents, meanwhile, are projected to lose market share to other product segments in the market till 2018. The types of solvents encompassed within the others segment, such as biobased solvents, are likely to witness rapid growth during the forecast period owing to their eco-friendly attributes. The report forecasts the global solvents market to reach an estimated value of US$29.28 billion by 2018, exhibiting a positive 3.2% CAGR. In 2011, the market was worth US$22.79 billion. The size of the market, in terms of volume, is expected to reach 21,530.8 kilo tons in 2018. The solvents market in Europe and North America is forecast to achieve moderate growth in the forecast period, since these markets have already reached saturation. 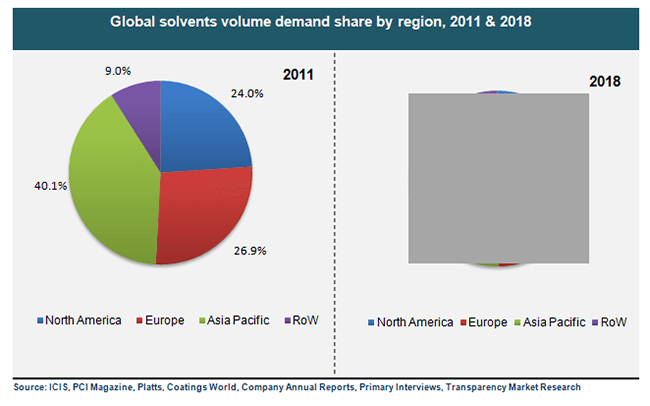 Asia Pacific dominated the global solvents market with a 40% share in 2011. The region, according to the report, will continue its dominance as the undisputed market leader owing to the robust economic development exhibited by India and China. The solvents market in the U.S. meanwhile, will suffer a major backlash owing to stringent government regulations curtailing the incessant production and use of solvents, which has resulted in environmental hazards. The U.S. and Canada comprise the largest markets for solvents in North America.